It is the mission of the Fredericktown Fire Department to ensure that all information that we carry is current for all commercial and industrial buildings. Having accurate information allows us to mitigate fire and rescue emergencies in a more timely manner. These objectives are achieved by regularly requesting businesses to update information on access, alarm systems, elevators, additions & renovations, etc. If you are an authorized representative of a business who receives fire protection services from the Fredericktown Fire Department then please fill out the preplan survey form below for your business. If this is your first time filling out the online preplan survey form, then please refer to the long form. If you have filled out the long form in any prior year, then please refer to the short form. If you have more than one building on site please use the contact form so we can arrange an on site visit. 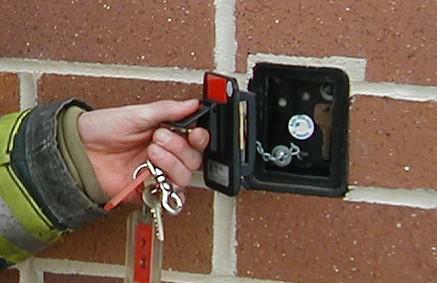 The Knox-BoxÂ® Rapid Entry System is a secure emergency access program developed for property owners and first responders. First Responders across North America use the Knox-Box Rapid Entry System to prevent costly entry damage while protecting property and lives. When a fire breaks out or there is a medical emergency, KnoxÂ® products allow immediate entry into buildings and property without forced entry damage or delay. Property owners store entrance keys, access cards and floor plans in high-security Knox-Box key boxes mounted near building entrances. Each Knox-Box purchased by a property owner is keyed to a single master key controlled by the local responding department. The Knox Rapid Entry System was developed to save property and lives. Disclosure: The Fredericktown Fire Department does not profit from the purchase of a Knox-Box. The transaction is solely between you and the Knox-Box company. Here are some common examples of hazardous materials or waste. Corrosive: Something that can corrode, or break down, metals. For example: vehicle batteries, plating wastes, sodium hydroxide, pool and fireplace cleaners. Ignitable: Liquids with a flash point less than 140° F, solids that are capable of causing a fire through friction, absorption of moisture, or spontaneous chemical change, or any ignitable compressed gas. For example: acetone, solvents, waste inks, some dry cleaning chemicals. Persistent Contains organic compounds, usually with fluorine, chlorine, bromine or iodine, that are persistent in the environment. For example: metal-cutting oil, and methylene chloride. Reactive Substances that are very unstable and rapidly, or violently change when mixed with or exposed to water, heat, pressure, or other materials. These substances, especially cyanide or sulfide compounds, may generate toxic gases under mildly acidic or alkaline conditions. For example: chromic acid, peroxides, perchlorates and cyanide. Toxic Characteristic toxicity: Wastes which, after testing through the Toxicity Characteristic Leaching Procedure (TCLP) by a professional laboratory, are found to contain high concentrations of certain pesticides, organic chemicals or heavy metals. Criteria toxicity: Contains chemical constituents that are toxic to fish and other animals. For example: photoprocessing fixer wastes, discarded pesticides, oil and transmission fluid, trichloroethylene (TCE), and some paint sludges. Please create or provide a diagram of your building(s), being sure to note the locations of the following items: exterior doors, electric shutoffs, gas shutoffs, alarm panels, sprinkler shutoff, fire department sprinkler connection, water shutoff, manual alarm pull stations, HVAC units, and the locations of specific hazards (greater than household amounts of chemicals, fuel storage, MSDS location, etc.). If you prefer to email an image file, word document, or PDF of your diagram please select that option below and we will respond back to you. Otherwise, mail it to Fredericktown Fire Department, 202 West College St., Fredericktown, Mo 63645, or fax it to 573-783-3575.